Described as a kind, hard-working Christian woman, Gladys Wundowa had already been up and working for several hours before she met her death on a morning bus in Tavistock Square on 7 July 2005. The mother of two left her home in Chadwell Heath, Essex, at 0400 BST for University College London, where she worked as a cleaner. Some five hours later, she left UCL for an appointment in Hackney, and boarded the number 30 bus that was blown up by suicide bomber Hasib Hussain at 0947 BST. The 50-year-old emerged from the wreckage but died shortly after from her injuries. Her husband, an architect who was working as a security guard, watched the news on television and became concerned when his wife failed to arrive home. After a three-day search, the family received confirmation she was dead. 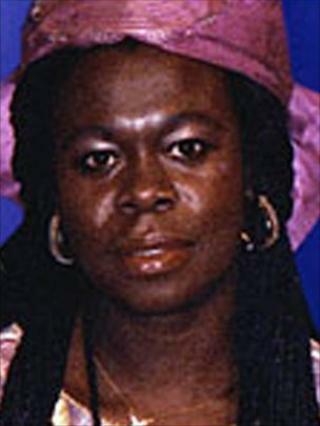 Born in Ghana in 1955, Gladys was one of six born into a coca-farming family. Known affectionately as Ama, she attended the local primary and middle schools but her parents could not afford to send her to secondary school. Instead, she took on jobs carrying cement blocks on building sites and mining a salt lake to support her family. In time she moved to the Ghanaian capital, Accra, where she worked for a Lebanese family as a maid, and when the family moved to London, she went with them. After a year in the UK, the family left but Gladys stayed, finding work as a cleaner at UCL and enrolling on a hairdressing course. In 1994, she started volunteering at a charity which helped African immigrants to settle in London, and three months before her death began a course in housing management. She was heavily involved in Downs Baptist Church in Hackney. It was shortly after moving to the UK that a friend introduced her to Emmanuel Wundowa. Two years later, they had a daughter, Azuma, and married in 1991. A son, Zakari, followed a year later. In a statement made to the police in 2006, Mr Wundowa said Gladys was a committed and loving wife and mother, and "a kind, hard-working and benevolent, very helpful Christian woman". Mr Wundowa told the BBC he and his wife had made plans to move back to Ghana and live in a house they were in the process of building. "She never had a problem with anyone. She would give her last dime to make you comfortable. And cheerful, always smiling," he said. In the days after Gladys's death, the Ghanaian president at the time, John Kufuor, visited the grieving Wundowa family and friends in Essex to offer his condolences. He had been on his way back to Ghana after an official visit to Jamaica. Gladys Wundowa was buried in her home village in Ghana, where 2,000 mourners attended her funeral.